In 2018, current CEO James Napier, being a knee down amputee, was determined not to let that disability affect him. James reached out to a friend, fellow patriot, serial entrepreneur, and current COO Lance Wood. Together, while eating some special hot sauces at a local barbecue, James thought that he could sell these hot sauces. In collaboration with their wives, The Patriot Brands LLC was launched shortly afterward. James then resurrected his dream of selling jerky. Being a local mom and pop shop with great capacity as a full service meat processor, James had secretly been working on perfecting some jerky flavors. Teaming up with trusted FDA certified processor Kill to Grill with their decades of experience manufacturing jerky, this The Patriot Brands Jerky was officially launched. Recently, The Patriot Brands LLC introduced meat sticks to their line of products for sale. This jerky is distributed by The Patriot Brands LLC, and they are located in Cuba, Missouri. 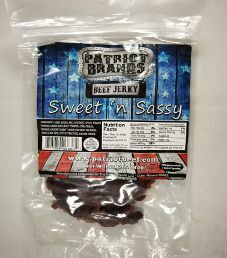 The next review on The Patriot Brands Jerky will focus on a 3 ounce/84 gram bag of their sweet ‘n sassy flavored beef jerky. This flavor is described as an almost Hickory flavored BBQ bringing a sweeeeet taste in every bite, with just a tad of sass… not hot, but mild enough that it’s got a little taste of heat. The bag was kindly submitted for review by COO Lance Wood. Ingredients: Beef, Sugar, Salt, Dextrose, Spices, Tomato Powder, Onion and Garlic Powder, Corn Starch, Natural Hickory Smoke Flavor (Contains Maltodextrin), Citric Acid, Spice Extractives, Sodium Nitrite. The beef used is not guaranteed to be free of growth hormones or additional antibiotics. Also, the beef is not guaranteed to have at least partial free range access to graze on grass. As a result, the highest ingredient rating that can be awarded is a Good (8/10) rating. There is no liquid marinade used here. Some people would call this a dry rub or old fashioned jerky. 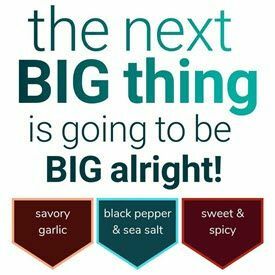 Some healthy ingredients are added such as garlic powder, onion powder, tomato powder, spices, and spice extractives. For a sweet based flavor as we have here, the sugar level is acceptable at 4 grams of sugar per 28 grams of jerky. The salt level is quite high at 660mg of salt per 28 grams of jerky to lose a rating. Our preference is 350mg of salt or less per 28 grams of jerky. 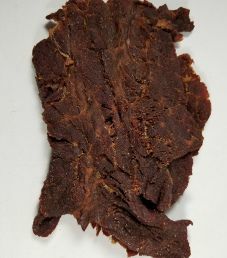 This jerky does not qualify to have no sodium nitrite added, as sodium nitrite is used outright to lose another rating. To a lesser degree, citric acid also acts as a preservative. Admirably, this jerky qualifies to have no MSG added. These strips of jerky are large in size, and they are sliced to a medium thickness. The texture is sort of on the dry side, being stringy, because the strips are sliced against the grain. The occasional piece of gristle is encountered, which enhances the natural beef flavor, but is not chewable. There is a distinct tomato fragrance emanating from these strips, along with a subtle aroma of smokiness. Immediately, a light level of smokiness is detected. Soon light levels of tomato and saltiness are noticeable, along with an almost bold level of sour acidity. An added bonus in this flavor profile are faint levels of the beautiful combination of garlic and onion. For a flavor with ‘Sweet’ in the name, there is a surprising lack of sweetness present. We tend to favor jerky flavors without much sweetness, but the sweet level should be at a higher level here. With a flavor name of Sweet ‘n Sassy you would think that it indicates a sweet & spicy based flavor, but not so much the case here. There is a slight kick to this flavor, but the heat level barely registers on the heat scale. Barbecue probably would be the best way to describe this flavor, but not exactly a well-defined barbecue flavor either. Sweet ‘n Sassy is a misleading flavor name for sure. With the light level of sweetness there is a decent amount of natural beef flavor present. We were not unanimous in our opinion with this Sweet ‘n Sassy flavor. Stéphane was not as impressed, where Paul and I quite enjoyed this flavor. Despite our internal disagreements here, and the discrepancies with the flavor name/description, Paul and I found this flavor to be highly enjoyable and addictive. If light levels of smoke, sweetness, tomato, and faint spiciness sounds appealing, look no further than this Sweet ‘n Sassy flavor. A 3 ounce/85 gram bags sells online for $6.50. That works out to $2.16 an ounce, which rates as a cheap price. This clear plastic resealable bag has a label affixed to the front, and nothing on the back. With The Patriot Brands LLC being so patriotic, it is no surprise whatsoever that the colors of the USA flag red, white and blue are used. There are no slogans or facts printed on this bag. The majority of bag categories are covered here. Missing is a blurb printed about The Patriot Brands Jerky and this sweet ‘n sassy flavor, Also missing is a best before date, but a sticker on the back is likely the batch number, which could translate to a best before date.